Knife Cold Steel 4-MAX(62RM) High quality Cold Steel knives, throwing knives, tactical knives. Andrew Demko is one of the most respected custom knife makers in the industry. The incomparable strength, and bold overbuilt aesthetics of his work have developed quite a following, and his custom knives have become highly collectible in recent years. Andrew has a well-established collaborative history with Cold Steel, working not only as a Designer and member of our Research and Development Team, but also as one of our PROOF crew, making world renowned cuts in our promotional testing videos! As a lifelong Martial Artist (a 5th Degree Black Belt in Aikido) Andrew shares many of the same interests as our President Lynn C Thompson, and together they have collaborated to design some of our most popular knives. It is with great pleasure therefore, that we are introducing the first of our Signature Edition Custom Classics; Andrew Demkos 4-MAX! Bringing together all of the finest elements of Andrew's design genius, the 4-MAX was developed with one goal in mind, to deliver the maximum strength and highest performance within a 4" blade limit. This over-built beast is without a doubt the strongest knife we have ever produced and we're willing to bet that right now, it's the strongest 4" folding knife in the world! Bridging the gap between production knives and expensive custom offerings, the 4-MAX is 100% made in the USA, from the finest materials available. The 4-MAX's extra thick, extra wide, drop point blade is made from USA CPM20cv steel - offering a near perfect balance between durability and edge holding performance. Sharpened to a razor edge with a stone-washed finish, it's as good looking as it is effective! 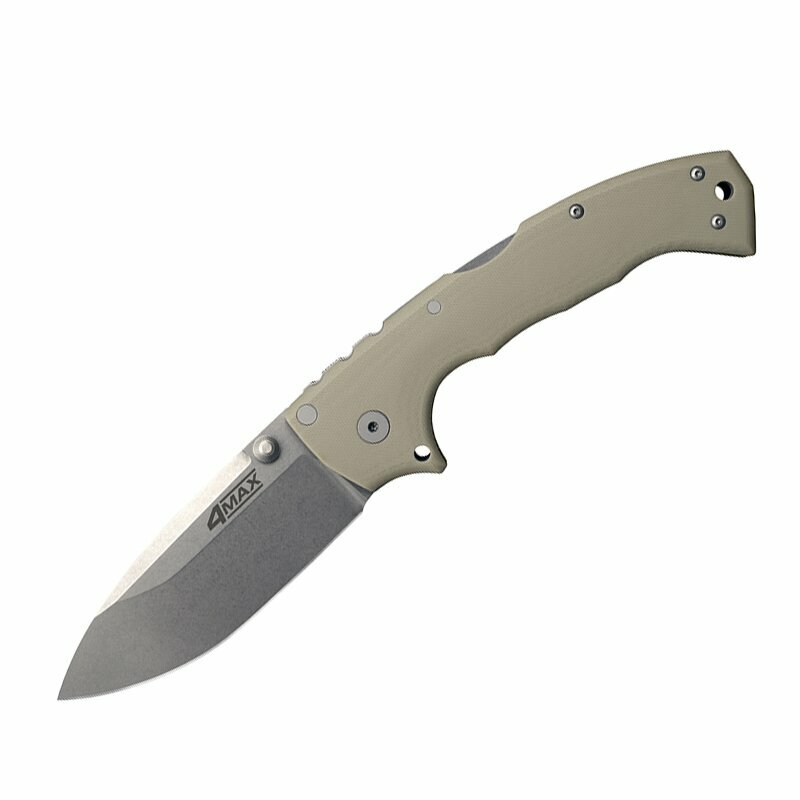 The 4-MAX's matte finished tumbled titanium liners and back spacers contrast beautifully with the Desert Tan 3-D CNC machined and bead blasted American G10 and provide an even greater degree of strength to this already immensely tough knife. Despite its highly collectible appeal, the 4-MAX is no mere "safe queen". It is not an "art knife" to be displayed in a glass case - it is built to work, and work hard! Unashamedly big, bold and beastly - the 4-MAX is a real heavyweight. Sure to last a lifetime of hard use - and more!